No matter what kind of business you run, it needs to have an effective website to survive in today’s marketplace. But that said; most hospital sites are created in haphazard ways that make them awkward, unintuitive and boring for users to navigate. If you’re like most then your current site isn’t getting the traffic it should or even retaining what little traffic it has, and it’s hurting your bottom line whether you know it or not. By investing in your website you can build a great asset that will promote your hospital in the best possible way and bring in considerably more revenues. Here, we'll give you a list of the 9 biggest mistakes your hospital is making on its website along with suggestions on how to fix them. All too often hospital sites are created without any thought about who they're trying to target. People dive in head first thinking only about how pretty they can make their site look and nothing else, which hurts them greatly. But the thing is that the criteria for success of a hospital's website is no different than that of Apple, Virgin, or Hugo Boss. It still needs to appeal to a specific audience and then motivate that audience to take action. So what exactly are you trying to do? Become a hub of education? Allow patients to contact various departments? 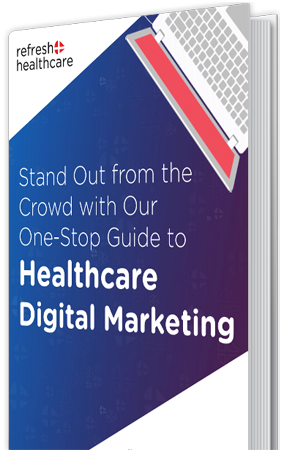 No matter what your goals are, execute on them well so your hospital stands out from the crowd and potential patients see the benefit of coming to you. Your website's functionality, design, social media accounts, and all the content posted therein need to be calibrated towards a specific demographic, and you ignore this at your peril. You can't be all things to all people, but you can be the right things to the right people. If you're trying to reach under 25s it would help to be on Snapchat or Instagram. If you're trying to reach over 55s then it will help for your website to be incredibly simple as this demographic are less tech savvy than most. Know your audience. Your website needs to be visually appealing, sure; but the main thing it needs is functionality. You don’t want to blitz your visitors with bells and whistles that dazzle their eyes but leave them confused about what to do next. What you want is to present them with a site that guides them to the information they need as painlessly as possible. Know your user and decide what’s most important for them to see. When everything is important, nothing is important! Have a website layout and structure that's intuitive and takes into account the fact that people naturally look from left to right, from top to bottom and are drawn to large elements. Simplicity and consistency are your friends. Make sure that your headlines grab the reader's attention immediately and entice them to read the full page. Have a blog full of educational posts that speak directly to your target audience. Make sure your pages are SEO optimised with key phrases users will be searching for to ensure that you rank highly in Google listings. Have calls to action at the bottom of your pages that let users know exactly what you want them to do after reading. Use video wherever possible. Video has been proven to get 8 times more engagement than simple text so think of ways to place interesting videos onto your site. Clearly inform readers of all your hospital's services. When discussing the benefits of hospital care, use before and after pictures whenever you can. This will prove your credentials to potential customers and persuade them to use your services. But please stay away from cheesy stock images as people don’t take them seriously and they don’t have the air of professionalism you need. You also don’t want to be seen to be using the same images as other clinics. Have appointment scheduling functionality. According to a Pew Research poll, over 60% of patients would like to be able to book their hospital appointments online. Give them what they want. Your website isn't like a book that you research, write, release and then never make any changes to. It's more like a shop. However; in order for a shop to remain profitable, it needs to constantly update its inventory, replace products that aren't selling with those that will, research the competition, create marketing campaigns and so on. Any shop that simply launches and then never does a single thing to stay fresh would slowly go out of business. And guess what? Your hospital's website will also fail unless it's regularly updated because Google gives priority to sites that are over those that aren't. Over 75% of web visitors arrive from search engine results, but if your site isn't being regularly updated, Google will assume it isn't important and not show it to them. If you don't have an online team in place to update your site, make hiring one your priority. Remember the previous line about successful shops updating their inventories and researching the competition? Your website needs to do the same. Think about the wants and needs of your target audience, ask yourself what you could be doing to meet them, and also how what you're already doing is either hurting or ignoring them. Also, research the competition regularly. See what other hospitals are doing both poorly and well and take notes. This will give you invaluable info that you can use to continuously improve your website. As well as asking yourself where your website’s going right or wrong you should also be using programs like Google Analytics to directly monitor its operations. Google Analytics will give you a daily updated list of statistics that relate to the performance of your site including your most and least popular pages, the average time spent on the hospital website, the country and city that your users have visited from and more. If you do this right, you’ll even attract international patients. The quality and low cost of Indian healthcare is very appealing overseas so use it to your advantage. 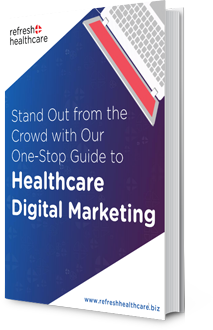 Run campaigns with specialist healthcare marketing partners and watch your revenues increase. As we said earlier, over 75% of traffic comes from Google searches and this means that you'll lose out on valuable hits if your site isn't properly configured. You definitely want to consult an SEO specialist for help with this but remember to choose the right keywords and place them within the text on your pages. Keywords are the phrases that Google and other search engines pick up and index for their listings. So if you have the keywords "Healthy Heart Hospital" in your website pages, then search engines will display your site whenever somebody looks for those terms. Keywords shouldn't be overused though; your page's copy still needs to be well written. Also, take a look a look at the graph below. It shows that 68% of all mobile internet searches are health related. You might not know this but most people browse the net via mobile devices. This means that the majority of online searches are related to topics that your hospital could be optimised for. As we said before, more people access the Internet through smartphones and tablets today than desktop computers. If you look at the graph below you’ll see that mobile internet usage grew steadily from 2008 – 2015 and this trend has shown no signs of slowing down. This means that if your site isn't mobile-friendly, you'll alienate most of your visitors. Everyone's aware of the benefits of social media but not necessarily those of email marketing. Loosely put, successful websites all have email lists and yours should be no different. By embedding an email signup form on your site you'll allow your most dedicated users to give you their contact details. This will allow you to inform them of new treatments or promotions, to poll them about how you’re performing, or just reach out in any other way you can imagine. If you don’t have an email list then build one immediately. If someone actively seeks out your hospital's website they probably want to contact one of your departments directly. Maybe they want to leave a message for a parent or partner who's been admitted. Maybe they're an outpatient who needs to contact their doctor. Maybe they have a question for one of your departments. Maybe they need to cancel and reschedule an appointment. Or maybe they're a potential investor who needs to talk to your management team. No matter what their reason for wanting to contact you might be, they need to be able to do that very easily. Make sure you have a dedicated contact page on your main navigation with the email and telephone numbers of all your relevant departments. You'll be surprised just how much your visitors will appreciate this one little change. And there you go, 9 proven but deadly mistakes that hospital's make with their websites. Contact us for more info on how we can help you to get the most from your site.